Rouyn-Noranda was the only road team to win Game 1 in Round 2, defeating the Remparts in Quebec City, 6-1. The Huskies scored twice in each period. Kucherov was second star for the second game in a row. He had two goals and an assist in the Huskies’ clinching win in Round 1. Game 2 against Quebec is Saturday. Host Armada outshot the Foreurs, 42-17, en route to a 10-1 shellacking of the league’s 10-seed. Cedric Paquette (pictured) had two goals and four points for the Armada, who look to go up 2-0 in the series at home on Saturday. Barrie had 22 shots in a second period as they outscored Oshawa, 3-1, in the middle frame and ended up beating the Gens, 4-1, in Game 2 of their second round series. Game 3 is Sunday in Oshawa. Mitchell Theriot (Islanders) had a hat trick for the Colts. Still seeking win one under Zettler. Cedrick Desjardins allowed 3 goals on 26 shots for the loss. Time is slipping away for the Crunch to regain their footing. They will end the night 2 points out of the top spot in the Eastern Conference and tied inside their division. They have a rematch with Hershey in Hershey tomorrow night, which starts a 2 game road trip that will be the final roadie of the regular season. 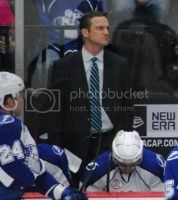 As he waits for his first win behind the Syracuse Crunch bench, Rob Zettler has gone through a range of emotions. He’s excited and energetic, and comfortable yet anxious. Although his tenure has started with three straight losses, he knows it hasn’t stemmed from a lack of trying. “These guys all want to win as much as I do,” Zettler said of his team. “I'm not worried about their effort. I'm not worried about how they played. We just have to find a way to get the W."
Bishop making Yzerman look like a genius. Ben Bishop stopped all 45 shots he faced for the shutout after being acquired from Ottawa in exchange for Cory Conacher. That's quite the debut for a goaltender who is the latest to be tasked with trying to close the gaping hole left since Nikolai Khabibulin shuffled off to Chicago many moons ago. I do like the deal Yzerman made. After a red hot first 7 games in the NHL, Conacher had cooled off greatly in the 28 games since and was not having the impact on a shift-to-shift basis some of the other rookies were having. He's not chopped liver, mind you, but he also was probably never going to have higher trade value and Yzerman knew that. Leveraging that asset for a true NHL goaltender is shrewd. Bishop, Martin St. Louis, and Benoit Pouliot were the game's three stars. For anyone who thinks Victor Hedman isn't important to this team, look what happened tonight with him out with a lower body injury early. 45 shots against and Bishop really having to bust it to save the Lightning's bacon. Hurry back soon #77. Also, we'll see if Vincent Lecavalier manages to get back into the lineup too after also leaving in his return from the shelf. I did really like Coach Cooper's thought of putting the vet between two potential stars like Connolly and Panik, and I'd love to see them get back to it. So it's not all roses in a 5-0 win, but good goaltending has a way of making everything look better. Alex Killorn had a helper and was +2 with 2 shots and 1 blocked shot in 18:33. Tyler Johnson had 3 hits and 1 blocked shot and was 40% on draws in 10:42. Richard Panik had 2 shots and 1 hit in 13:28. Radko Gudas was +1 with 4 penalty minutes, 4 hits, and 1 blocked shot in 20:34.